Hurricane Ridge is almost like one of those places classified as a Wonder of the World. It's just that magnificent. Often this will be a private tour but sometimes you will travel with 2 or 3 others. 5 maximum allowed. We travel in our comfortable SUV and your guide, also the driver, with talk with you about what you see along the way as well as when you get there. Magnificent mountains, rivers, and viewpoints await you. We've added in a trail walk at Marymere Falls, plus Madison Falls. Join us! You'll be picked up at your Seattle area hotel then travel about 30 minutes to a ferry terminal North of Seattle. 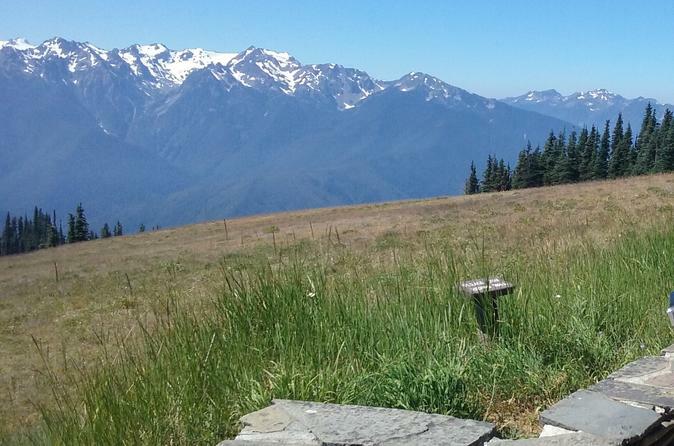 Enjoy a 30 minute crossing, then continue to Hurricane Ridge. You'll stop for a rest break along the way. The Ridge itself is remarkable in it's visual and grandeur. There are meadows and cliffs and mountain tops to look down at, and many nice paved trails for your enjoyment. Often we see deer on the trails, and sometimes other fun animals. There are 2 Visitor centers. with lots to see and learn about the deer, the many flowers, and the mountains themselves. There is also a nice gift shop at the Upper Visitor Center. You will have plenty of time on your own at Hurricane Ridge to wander, and we know you'll love the Marymere Falls trail. Not difficult, it gives you the moss and ferns aspect of the Olympics.